Nature-loving pupils are building bird feeders to protect local wildlife during the winter, thanks to a donation of timber worth more than £350 by a luxury homebuilder. 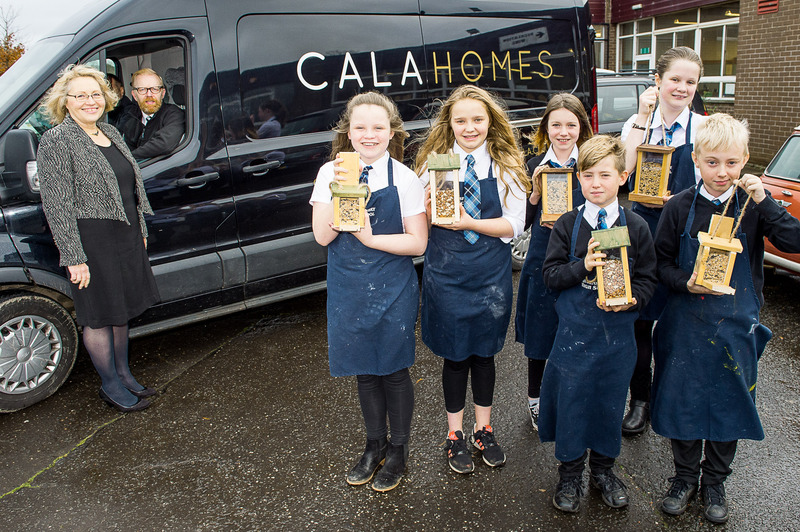 CALA Homes (East), which has a major new-build development in the area, has made the generous contribution to Queensferry High School, to support Design and Technology pupils with their current projects. It marks the second year that the homebuilder has supported the High School, having last year made a similar donation of valuable timber to help pupils build bird and insect houses and hedgehog homes. Janet Thomas, Curricular Leader of Design and Technology at Queensferry High School, said: “We’re very grateful for this second generous timber donation from CALA, as project materials can be hard to come by. “Thanks to the house builder, the Design and Technology students are very excited to be able to continue with their winter projects, which including building bird feeders for wildlife that may struggle to find food, as well as making Wind Whirls to decorate their gardens. Brian Johnson, Construction Director at CALA Homes, said: “Despite the mild autumn we are experiencing, winter will soon start to bite and it is important for the local wildlife to be protected throughout the colder months. “The school is at the very heart of the local community and it’s fantastic that the pupils are getting involved in such a vital project as this one. CALA Homes also works with local Colleges and the CITB to support apprenticeship programmes and other local initiatives. In the past year, CALA has taken on 10 new apprentices across its regions, which it will roll out on a larger scale over the next few years. CALA Homes (East’s) Dalmeny Park development features a selection of four bedroom townhouses and three bedroom terraces with prices starting from £315,000, as well as one and two bedroom apartments, from £220,000.